This is the second best book I've read in 2014. It was engaging, and quite amazing. I was sick over the holidays so I had a lot of time to read. 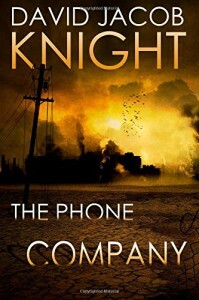 Steve lost his wife to cancer, and five years later The Telephone Company moves into town. They seem to assimilate into everything, using smartphones with disturbing apps. The Phone Company gets more disturbing and controls the town. Steve's kids JJ and Sarah get the smartphones and are drawn into the apps. They can get popular, play ""war games"", and spy on people. Steve's best friend Bill is a cop who resists the Phone Company's glasses, which are like Google Glass. It is impossible for him to do things since the Phone Company is integrated into the police force. The disturbing entity that is really the Phone Company appears, and is Lovecraftian and pretty awesome. READ THIS BOOK!